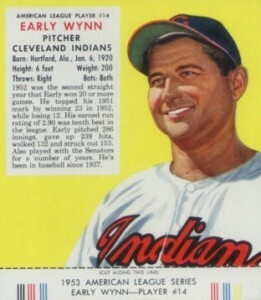 Early Wynn earned a reputation as an elite pitcher while being part of arguably the best pitching rotation in history with the Cleveland Indians. Later in his career, he would blossom as a knuckleball pitcher, winning a Cy Young award and cracking the 300-win plateau. In this top list, we cover the best Early Wynn baseball card appearances stretching throughout his storied career. Shop for Professionally Graded Early Wynn Cards on eBay. Before pitching with Bob Feller and Bob Lemon with the Indians, Wynn began his career with the Washington Senators and was eventually traded to Cleveland in 1948. 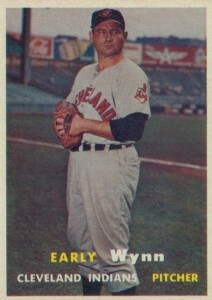 While with the Indians, Wynn became a workhorse pitcher and won more than 17 games in a season eight times. Traded again in 1957 from the Indians to the Chicago White Sox, Wynn enjoyed a resurgence as the ace of the White Sox staff. He won the Cy Young Award at 39, going 22-10 and leading the league in starts and innings pitched. With the exception of the 1948 Bowman set, Early Wynn makes appearances in all the early Bowman and Topps sets, so collectors have many opportunities to find his cards in the most popular sets of his day. He was elected to the Hall of Fame in 1972 with two other legends, Yogi Berra and Sandy Koufax. 2003 Donruss Timeless Treasures included a dual relic that features Berra and Wynn together. Wynn struggled to get to the 300-win plateau after being stuck at 299 wins for several months. When it finally did occur, he was famously photographed holding up three fingers in honor of that monumental victory. Collectors can find several cards in contemporary sets featuring that photograph, including 2006 Upper Deck SP Legendary Cuts. 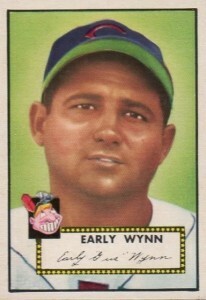 Despite the long period encompassed by his career that lasted from the late 1930s to the early 1960s, card options for Wynn are somewhat limited given that the early years of his career offer no trading cards. Without a traditional rookie or other early-career cards, presenting a comprehensive list from Wynn's entire career is a challenge. In building this list, card value was balanced with individual card design and availability to collectors. Collectors can find two artistic cards of Wynn in the 1952 and 1953 Red Man Tobacco sets. The bright yellow background of his 1953 stands out from other cards of the day and the vivid design is something that wouldn't really be seen again until 1959 Topps. 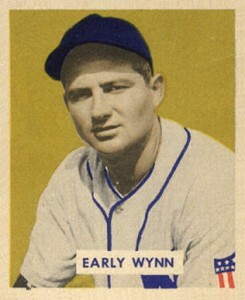 Although Wynn is famous for his role in the great Cleveland Indians' pitching rotations, he also had some excellent seasons pitching for the White Sox. 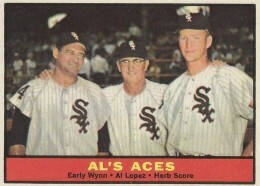 He won the Cy Young Award with the team and this 1961 Topps card features Wynn with 1955 Rookie of the Year Herb Score, and Hall of Fame manager Al Lopez. Because Early passed away in 1999, he was not included in many certified autograph sets. This is a shame because Wynn's autograph is a thing of beauty with the flamboyant "y" letters in both is first and last name looping under the rest of the signature. Collectors can track down some cut autographs issued by Upper Deck over the years but they are more likely to find a jersey relic featuring pieces from his wool jerseys. This Wynn relic from the 2003 Flair Greats set offers a solid example of budget-friendly memorabilia option. Wynn's 1957 Topps cards gives you a good idea of the imposing presence he had on the pitching mound. The reverse side of the card lists him as six feet tall and 200 pounds, but batters facing his speeding fastball might believe he was even larger. 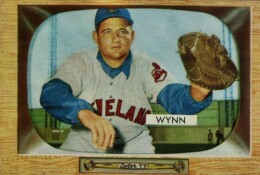 While many players in the early 1950s would sign exclusive deals to appear on either Bowman or Topps cards, Early Wynn appeared in both sets until Bowman's final set was issued in 1955. The reverse of Wynn's card includes an essay to young baseball fans that tells them they should join Little League and play baseball as much as they can. 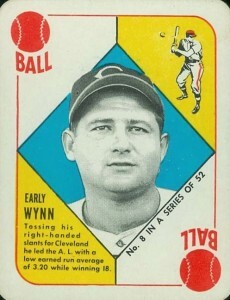 Wynn's first Topps card can be found in the legendary 1951 Topps that was divided between red and blue-backed cards. He was included in the red set that has been shown to be more available to collectors than the blue series. Both series had 52 cards and were sometimes sold in groups of two cards for a penny with the two cards attached on one edge. On the back of Wynn's 1950 Bowman card you might notice that he is listed as pitching right-handed and batting as a switch hitter. By some accounts, Early was just as good a batter from both sides of the plate as he was a pitcher and he is one of only five pitchers to hit a grand slam as a pinch-hitter. 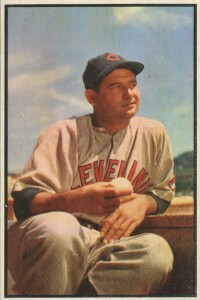 You'll find Wynn sitting on the dugout steps on his 1953 Bowman Color card, holding a baseball in the fastball grip. Early in his career, Early was known for his blazing fastball and a tendency to throw at batters who he deemed as crowding the plate. Toward the end of his career, he developed impressive off-speed pitch skills. Collectors can find Wynn's most sought after Topps card in the amazingly popular 1952 Topps set. While the 1951 Topps set (see entry #5 on this list) used black-and-white photography, Topps went with colored paintings of photographs for their next set. In terms of value, this card can go toe-to-toe with the first card on this list when well-graded version come up for auction. 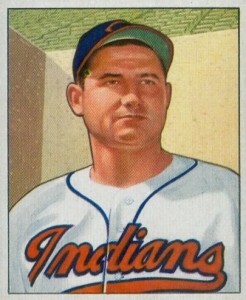 Wynn had been in the league for ten years when Bowman produced his first trading card in the 1949 Bowman set. Cards #1-108 didn't include a nameplate and Early's card just made the cut to have that included. While many nameplates featured nicknames, Wynn's nickname of "Gus" wasn't included. Highly-graded copies often go for over $500 at auction. 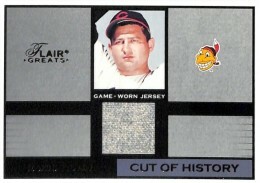 EARLY WYNN 2010 TOPPS TRIBUTE GOLD GAME JERSEY #19 25 -INDIANS!!! 1952 Red Man with Tab Early Wynn Indians HOF SGC 60 ! !